I've been watching the media coverage of a paper by Julien Riel-Salvatore and Claudine Gravel-Miguel, which is to appear in the soon-to-be-published Oxford Handbook of the Archaeology of Death and Burial. In it the authors make much of the variability of Upper Palaeolithic (UP) burials in Eurasia since the first modern humans began colonizing at give-or-take 40 Ka. I first heard of their work through the February 23 Past Horizons archaeology web log, which is featured in the blogroll on SA. That blog reported on the article, and included quotes from Julien himself. This morning I noticed that Julien had put up a long post on his own web log, A Very Remote Period Indeed. The authors, through J. R.-S., thought it best to put the article in context, because they feared the media were running with a slant that didn't do their work justice. In J. R.-S.'s blog was a link to a galley proof of their contribution. It is to that original paper that my remarks are aimed, and not any of the spin---whether that of the media or the authors. The lion's share of their 44-page-long contribution comprises 19 pages of tabulated observations, 9 pages of references, 1 1/2 pages of pie charts, one page of histograms and the 1/2-page map reproduced below. [Yawn] The remaining 11 pages of introduction and analysis remind me that, where burial is concerned, I might be tilting at windmills. But if I'm tilting at windmills, these authors are fencing with straw men. 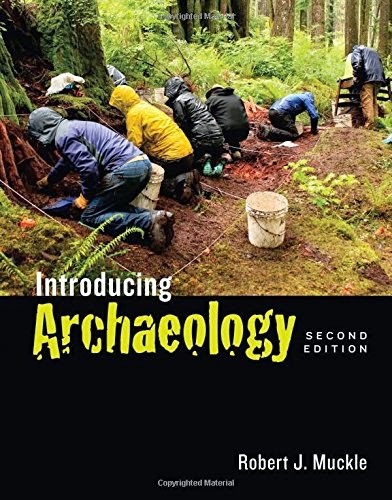 According to the authors, it's necessary to investigate the variability in Upper Palaeolithic burials because the conventional wisdom states that burials from this time are rich in grave goods and stand in contrast to what came before (i.e. Middle Palaeolithic burials). I'll leave it to you to decide how big a straw man this is. Suffice it to say it was big enough in the authors' minds to warrant this research. To achieve their goal of assessing Upper Palaeolithic burial variability the authors set their temporal limits at 45 Ka and 10 Ka. They seek to capture any data from the presumed earliest incursion of modern humans until approximately the end of the Upper Palaeolithic [and prior to the transitional Mesolithic]. The authors are keen to use what might be termed a 'clean' dataset. So, they exclude burials from their chosen period in southwest and southeast Asia. Bang, out goes the Natufian, particularly rich in burials, but which might be tainted by agriculture and therefore not useful for comparison with the rank and file Upper Palaeolithic of the rest of Eurasia. Be that as it may. They get to draw the lines any way they please. It's what they do within those lines that matters most. the number of interments show two peaks, the main one during the 31,250–28,750 cal. bp interval, and a slightly more modest one between 13,750– 11,250 cal. bp. They are separated by over 15,000 calendar years which suggests the pattern is not simply an artefact of time-vectored differential preservation where we would expect to see a continuous increase in the frequency of burials as we move towards the present ... . While the absence of corroborating palaeontological and geological data prevents us from ascertaining this ... , some very unusual preservation biases would have had to be at play to exclude human intentionality as the driving factor. 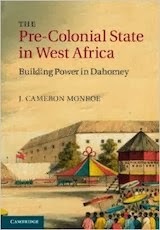 No need whatsoever to ascribe differential preservation to any graves that may have existed in the period and the region about which the authors are speaking. There wan't anyone there to bury! I hate to be the one to point this out to the authors [the Hell I do! ], however the time between about 26,000 and about 14,000 years BP circumscribed the Last Glacial Maximum. 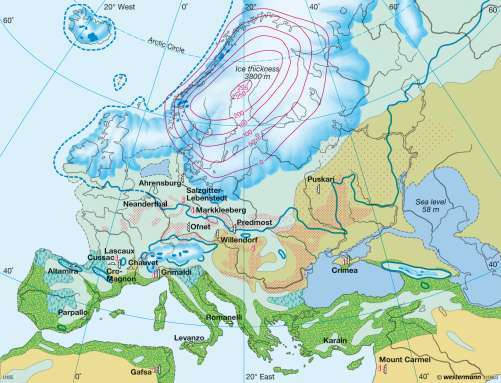 As you can see from the graphic below, the ice sheet during this period engulfed most of the British Isles, all of Scandinavia and a great east--west swathe of northern Europe. Most of the unglaciated land to the south across northern Europe [the area with few burials during that time] was periglacial. Nothing but permafrost and tundra vegetation. There's no mystery that the UP people weren't there at that time, even when they had been in the early part of the UP. It was too friggin' cold! The quote following the map below pretty much says it all. From Riel-Salvatore and Gravel-Miguel 2013. [... the map above] also highlights that only southwest France and the Italian regions of Liguria and Puglia have yielded burials attributed to the two periods. Since most of Italy has yielded Late but not Early burials, this pattern is unlikely simply to be an artefact of regional research histories, a point reinforced by the fact that countries with rich histories of research (e.g. 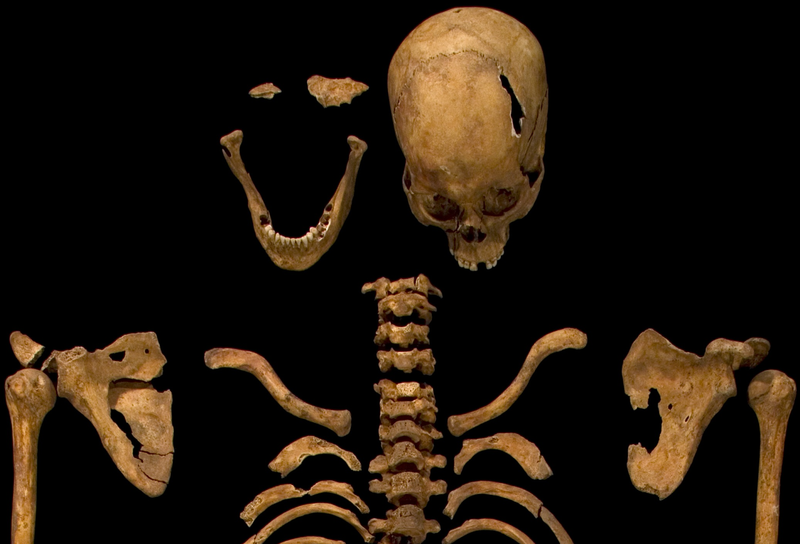 Spain) have yielded no UP burials despite having a rich Mesolithic burial record ... . [...The figure] therefore suggests that there was a dramatic contraction of the area in which burial was practised after the end of the Gravettian [i.e. during the LGM]. The Late sample also becomes considerably denser over the more limited area over which it is distributed, with areas of Western Europe devoid of Early burials looking as though they were somehow ‘backfilled’ by burial- practising populations (e.g. central and northwestern Italy, parts of Germany). They're saying that they're bemused at the absence of burial in the more northerly reaches during the middle of their temporal range. Doh! That these authors would even consider research intensity and forget all about the effect of the climatic conditions during the middle of their temporal range amazes me. How about you? I'm tryin' ta figger out whether or not I'm playing a metaphorical game of Whack-a-Mole. 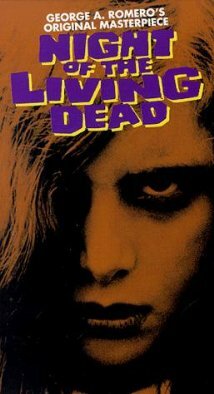 I suppose I could be trapped in an endless loop in The Night of the Living Dead. "These things are sent to try us," my agnostic Dad used to say. My gut tells me to scream and run very fast for the nearest exit. Once again I'm face to face with a bit of archaeological inference-making that I missed whilst wandering in the desert. This bit was gleefully dropped in my email inbox just this morning. The news might be half-a-dozen years old, but this news item is hot off the presses. None other than Iain Davidson was responsible. The subject line read "You're gonna love this!" Love is hardly the word for it! Until recently, scientists have encountered scant evidence of Neanderthal ritual or religious practice. A new discovery, though, suggests that Neanderthals—much like today's bear hunters—ceremoniously cut off panther paws and kept them as trophies. You've all read the 'book' on Sima de los Huesos and the other sites in northern Spain. This latest bit of skull-duggery archaeological myth-making comes to us from the other side of that country, from a locality named the Sima de las Palomas, near Cartagena. The depositional circumstances are clear from the flashy graphic they've made, shown below. As with the other Sima, this one is what's known as a natural trap. All kinds of animals met their death here, including at least nine Neanderthals. What's strangest of all: I've never heard of this guy or his site. Fact, if I mentioned his name in a room full of my closest archaeology buddies it'd sound like a flock of owls. So, you've all read the 'book.' Now, thrill to the movie! Direct from PBS's Nova... [which, as you know, in Spanish means 'it doesn't go']. I'm convinced. I wonder if it was a black panther. If so, perhaps its proximity to Gibraltar means that these Ns were just like the ones at Gorham's Cave in picking out for reverence [or evening wear] just those animals with black or very dark plumage/pelage. Food for thought. Let's Call the Whole Thing Off! You Say Hominidae and I Say Homininae. Jonathan Marks alerted his facebook pals to this, and I'm gonna use it as a springboard to argue for a revision of the most-recent revision of the Primate Superfamily, Hominoidea, to which you and I belong. The author asks why it is that humans are lumped with the Old World hominoids---Pan, Gorilla, and Pongo---also known as the great apes. The author cleaves to a point of view to which I and a rare few others have propounded for quite some time. To wit, modern humans are unique among the other apes, notwithstanding all of the marvelous behaviours of which we know our ape cousins are capable. Cadell posits two reasons for the relatively recent reclassification. b) an evolutionary past that has left us with no extant sister taxa. splitting humans from great apes taxonomically would be beneficial. Conceptually it would allow researchers to better understand the hominid/ape divergence and the key differences between humans and great apes today. 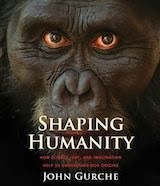 But perhaps more importantly, splitting humans from the great apes allows us to reconceptualize our own humanity. We are not the great apes; we are humans. I should start by saying that I've passed my 60th birthday, and I cut my human-palaeontological teeth 40-plus years ago at a time before molecular comparisons included individual base pairs. In those days it was quite all right to classify all apes in one exclusive taxonomic group, the Superfamily Hominoidea, and subdivide them as follows. Superfamily Hominoidea, broken down as shown below. Clean and simple. No? We're different from the other apes. In retrospect this classification appears somewhat naïve. From molecular biology we now know that the oldest extant lineage among the tailless Catarrhini is the one from which the four extant gibbon genera have evolved. That hasn't changed---the gibbons are still classified as Hylobatidae. 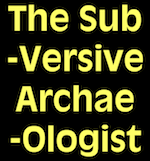 During my absence from the pixels before you I've many times thought I should retitle this blog the Submersive Archaeologist, so deeply this time has it seemed to me that I've descended into the rabbit-hole. Which rabbit-hole was that? The one out of which emerged the present-day view of Hominoid taxonomy, against which I've been fighting a losing battle with cladistics on the matter of what to call you and me and the other members of the genus Homo in terms of which the International Commission on Zoological Nomenclature would approve. Wood and Richmond pretty much carved in stone this new view of the Superfamily Hominoidea a few years back. 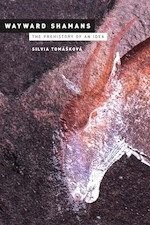 ["Human evolution: taxonomy and paleobiology." Journal of Anatomy 196:19--60, 2000.] Their scholarship is not in question here. I'm quibbling about names, not anatomy; natural groups, not genes. I lost the battle I waged with windmills over the past couple of weeks because the molecular biology can't be refuted. As we construct the hierarchical relationships between us and progressively less closely related organisms, it's simply irrefutable that we share common ancestry with ever-more-inclusive pairings of hominoid groups. According to the consensus view, the most recent of these common-ancestor diads to which we belong is the tribe HOMININI---comprising the Subtribe HOMININA [Genus Homo], several subtribes of fossil bipedal apes, the Subtribe PANINA [Genus Pan (chimpanzees and bonobos)], and any subtribe or subtribes of Pan's fossil precursors. The next most inclusive grouping---Subfamily HOMININAE---includes the tribes HOMININI and GORILLINI [Genus Gorilla and the tribe or tribes comprising Gorilla's fossil precursors]. Next most inclusive grouping---Family HOMINIDAE---consists of the subfamilies HOMININAE and PONGINAE [which includes all of the fossil hominoids not belonging to either the subfamily HOMININAE or the family HYLOBATIDAE]. This use of the taxon HOMINIDAE (Gray 1825) is, I believe, pre-emptive and arbitrary. By rights it should be the Family PONGIDAE that makes up of the group of hominoids that remain once you exclude the gibbons and fossil forms belonging to the family HYLOBATIDAE. Instead, the wizards that renamed the entire superfamily chose to use HOMINIDAE (Gray 1825), most likely because according to the International Commission on Zoological Nomenclature the family name HOMINIDAE has 'priority' over PONGIDAE (Elliot 1913) in the long history of naming organisms. I've made a slide that I think presents the choices entailed in classifying the hominoids. It has made it easier for me to get my head around the issues. Keep in mind that the first two chips off the old block---the gibbons and orangs---arose we know not where, at about 18 Ma and 14 Ma, respectively. All we can be certain of is that their descendants are today found only in east and southeast Asia. [Yes, I said east Asia. The gibbons are extirpated throughout most of what's China today. 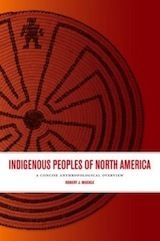 However they were widespread historically and figure prominently in iconography and legend in that part of the world. In presenting the above, I'm hoping that it'll become clear that it's not a straightforward matter what to call the smaller and smaller remainders of the great geographic swathe of hominoids when all that's being considered are the molecular data from extant lineages. What, for example, do we decide to do about the inevitable evolutionary dead ends at each successive rank? As it is, the nomenclature is being stretched. A few more spurs on the family tree and we'd run out of nomina in a real hurry. The upshot: no one's ever made such an inclusive classification as the one depicted above. Thus, I think that nomenclatural priority shouldn't apply in this case, and that the group that sits opposite HYLOBATIDAE by rights ought to be PONGIDAE (Elliot 1913), if only because PONGIDAE has priority when naming the group containing Pongo, Pan, and Gorilla and all of their fossil precursors. That had been the case up until molecular data put the kibosh on lumping Pongo with Gorilla and Pan. Adding the bipedal apes shouldn't, to my mind, imply substituting PONGIDAE with HOMINIDAE. In addition, using HOMINIDAE in this way, after so many, many years of using it in the old way, seems to me to be more confusing than it needs to be. And, alternatives are available, which wouldn't require as all-encompassing a revision as the one seen above. I say, dump HOMINIDAE as a taxon! Nothing, for example, precludes use of the zoological rank of Epifamily as the rank immediately following Superfamily. The following provisional revised revision more closely follows what we know of the pace of hominoid evolution. The Epifamilial split occurred about 18 Ma. That of the Family happened about 14 Ma. Thus, the African great apes, more closely spaced in time---a common ancestor some time in the last 7 or so Myr---comprise a family, within which the gorillas on the one hand, and chimps and humans, on the other, inhabit different subfamilies. This suggested hierarchy violates none of the molecular data, while still providing plenty of leeway for the addition of taxa as our knowledge of hominoids expands. That's all I'm a gonna say about that! Biruté Galdikas's favourite American country music song is "Take the gibbon from my hair." Forgive me, Reader, for I have thinned. It's been 9 days since my last expression. I think I'm a victim of learned uselessness. It's the only way I have to explain my absence from the intertubes this past week or so. And it's not as if I've been busy doing anything else. Piles of piles surround me and the final solution will undoubtedly be to bring a firehose in here and just flush it all out and start over again. 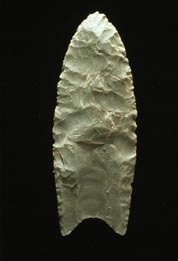 The other matter that keeps trying to worm its way out of my overworked brain is a novel argument that seeks to put an end, once and for all, to the notion that hand axes and Levallois flakes are the result of ideas in the heads of every hominid since Homo erectus. You can probably guess how easy that's going to be. So, please, have pity. My mind's working 23/6, but nothing is ready to be excreted therefrom as yet. Riddle: What's Better Than Marrying Someone Whose Parents Own a Liquor Store? I used to think there might not be a better set of circumstances than being related to the owners of a liquor store. Now I know there's something almost as good---upstairs neighbours who are accomplished amateur brewmeisters! At this moment your favourite archaeologist is pouring a glass of hefeweizen from a 750 ml bottle that the upstairs neighbour gave me just a few moments ago. He and a pal are serious about this craft, by the look and the taste of it. They have a kegging system with a bunch o' 20-L kegs, CO-two bottle with different valves for different kegs. They're serious. And, although I was aware of his home-brewing before now, I'd never seen the keg setup, nor had I been fortunate enough to taste their products. So, when I came across him and his beer today the poor guy made the fatal error of mentioning to me that they needed to "get rid of" what's left of the hefeweissen and a Scottish ale, to make room for in-progress brews. In a very uncharacteristic way, I brazenly fastened on his words and suggested that if he truly needed help in such matters that he need only whistle! Ten minutes later I walked downstairs with a bottle of each. Now, I've had my fair share of malted beverages and I have to say that so far I'm giving these guys top marks. [And not just for generosity!] The hefe is about the colour of ginger ale and smooth as a baby's arse. It's nutty and grassy, and almost still, like a true ale should be. In the cellar of Murphy's saloon. Grotte des Pigeons in eastern Morocco, near the village of Taforalt. Photo by Abdellah Elbadaoui (Panoramio/GoogleEarth). As I continue to wend my way through the literature I've missed during my absence from palaeoanthropology, I'm forever discovering scholarship that makes me think I'm on the other side of Alice's looking glass. Yesterday, while nosing around in search of background knowledge for the Subversive Archaeologist, I found another beaut that I can't ignore. And today I found it a companion. The two articles concern recovery of perforated marine shells from about 80 ka at the site known as Grotte des Pigeons [pictured above], near Taforalt in Morocco and at Blombos Cave, in South Africa. Of greatest interest to me is the way the authors attempt to rule out natural processes in pursuit of an explanation for their presence in the caves. For example. Remember Raymond Dart and the "osteo-donto-kerartic culture" of the australopithecines? 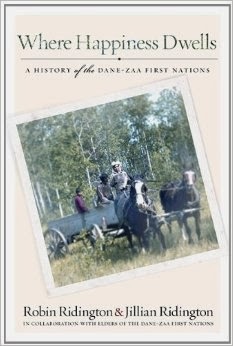 Dart had observed the behavior of members of traditional societies in southern Africa. He noted that when attempting to extract marrow from the long bones of their prey, they employed what Dart referred to as "the crack and twist" technique. The marrow seeker would strike the shaft hard enough to crack it. Then, grasping one end in each hand, the hunter would twist the ends in opposite directions until the shaft broke open. On the basis of these observations Dart proposed that the presence of similarly broken fossil bone meant that the Australopithecines had been hunting, then cracking and twisting the long bones to extract the marrow. It was many years before someone pointed out that the same effects can result from carnivore modification, and that it was much more likely that the presence of bones broken in that way was the result of carnivore behavior, rather than that of small, bipedal apes. Dart had premised his explanation on the only analogous process of which he was aware at the time. Such shortcomings permeate the archaeological canon. They remind us that we must always consider the possibility of equifinality---the idea that more than one process can result in a given set of observations. Moreover, to determine whether your observations are humanly or naturally produced, you need to involve as broad a range of present-day analogies as is possible. In the case of Grotte des Pigeons and Blombos Cave, the archaeologists have posited evidence that is sufficient to explain what they recovered, but their evidence is by no means the only possible explanation, nor necessarily the most parsimonious. At best their evidence is equivocal [a accusation that I've used over and over again in my work]. Enough preaching. On to the sea shells. When viewing these images, keep in mind that the shells themselves measure about one centimeter across and slightly more in the longest dimension. Thus, the perforations are on the order of 500 microns in diameter. Note also that a great many of the perforations are irregular, and look more like they've been broken open rather than having been drilled. From Bouzouggar, A., N. Barton, et al. (2007). 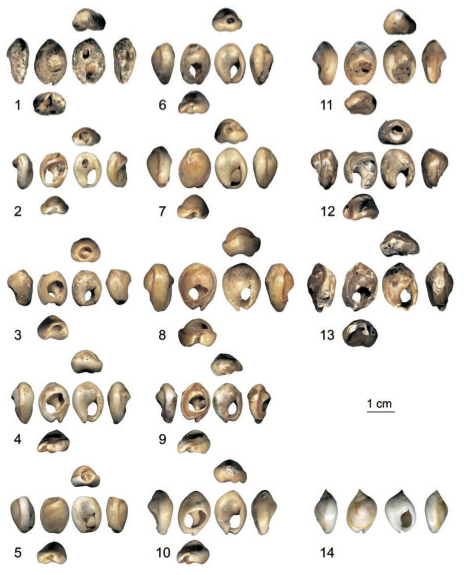 "82,000-year-old shell beads from North Africa and implications for the origins of modern human behavior." Proceedings of the National Academy of Sciences 104(24): 9964-9969. Specimen 14 is a modern-day individual. The photo montage below seeks to illustrate the areas of 'unnatural' polish and other markings on several of the Pigeon Cave shells. The authors claim that these are likely to be the result of having been strung like a strand of ... well, beads. I'd have to say that these aren't patterned alterations. The photomicrographs below illustrate the red oxide on some of the putative beads from Pigeon Cave. The reddish material adhering to some of the shells from the cave was chemically characterized as hematite. Hematite is also known as ochre. As I stated above, there appears to be little rhyme nor reason to these alterations. At Blombos Cave the story is much the same. Total number is larger; different species; similar alterations. And I would make the same statement again: beyond the mere presence of fenestrations, their morphology and other modifications to these shells is hardly what I'd call patterned. Henshilwood,C., d'Errico, F., et al. (2004). "Middle Stone Age Shell Beads from South Africa." Science 304:404. Fig. S1. 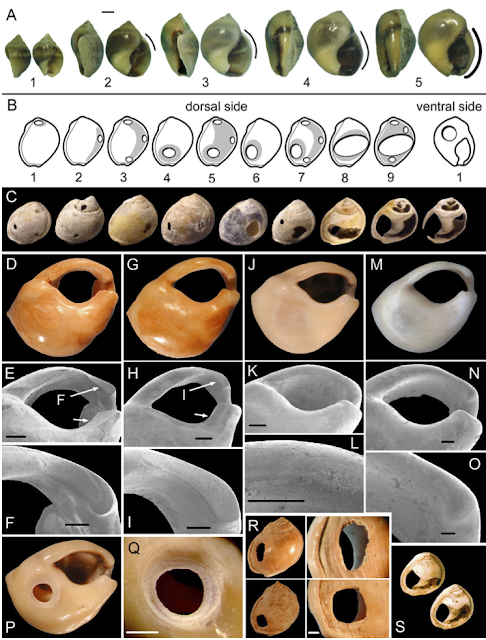 (A) Juvenile (1), sub-adult (2-4) and adult (5) Nassarius kraussianus shells from the modern biocenosis of Duiwenhoks estuary (Cape Province, South Africa) showing gradual size increase and thickening of the lip (solid line). Blombos MSA beads (R) are all made on adult shells (scale bar, 1mm). 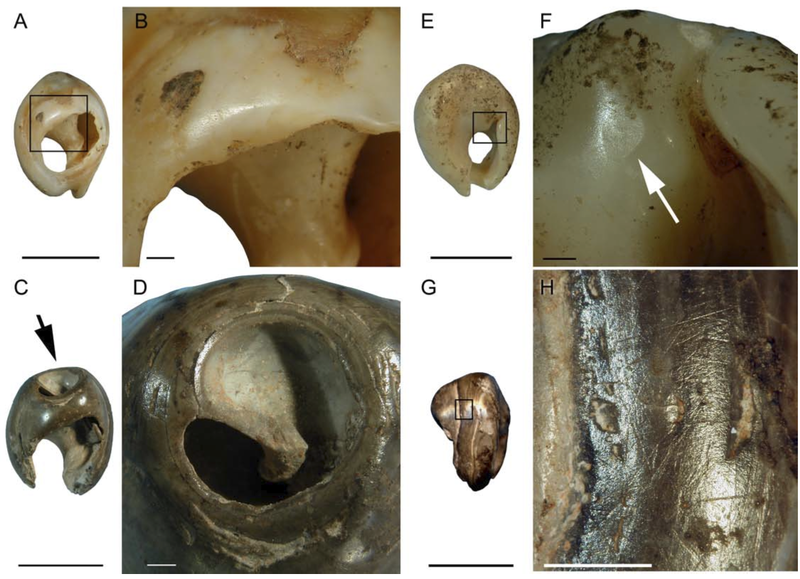 (B) Perforation types observed on N. kraussianus shells from modern and archaeological collections. The shaded area indicates the variability in hole locations. Types 6 and 8 on the dorsal side, found respectively on 63% and 24% of MSA beads, are observed on 2% and 3% on natural shells (N=2587) from Duiwenhoks and Goukou River estuaries. Type 1 on the ventral side (P, Q), produced by the predator Natica tecta, is present on 60% of shells from modern thanatocoenoses (N=1836) and absent on MSA beads. (C) Perforations on the dorsal side of dead N. kraussianus from the Goukou estuary. (D-I) Macro- and SEM photos of use wear on two MSA N. kraussianus shells (E,H, scale bar, 1 mm; F,I, scale bar, 500μm). (J-O) Macro- and SEM photos of a modern (J-L) and LSA (M-O) N. kraussianus shell showing absence of wear facet on lip (K, scale bar, 1mm; L, scale bar, 200μm; N, scale bar, 500μm; O, scale bar, 200μm). (P-Q) Ventral aspect of a modern N. kraussianus with hole drilled by Natica tecta (Q, scale bar, 500 μm). (R) Perforations on two orange MSA N. kraussianus shell beads from Blombos Cave (scale bar, 1 mm). (S) Typical white N. kraussianus shell beads with large perforations from Blombos Cave LSA levels. Verbatim from Henshilwood,C., d'Errico, F., et al. (2004). 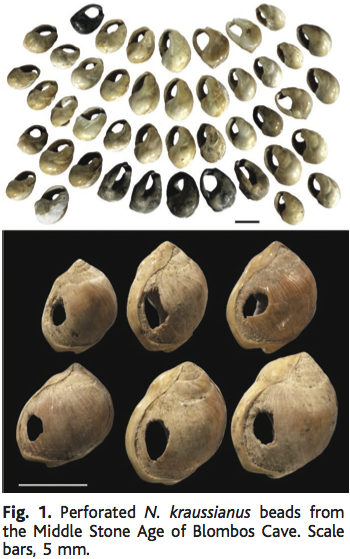 "Middle Stone Age Shell Beads from South Africa." Science 304:404. So, at La Grotte des Pigeons and at Blombos Cave, archaeologists were compelled to interpret the origin and mode of deposition of these objects. I won't suggest that they were grasping at straws to give these finds importance from an evolutionary standpoint. I'll let you be the judge. 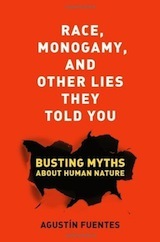 Both sets of authors use evidence from ethnography, natural history, or geology. For example, we know the shells don't occur naturally in these caves. Simple enough. True enough. But, how do we assess their assertion that the shells could have been purposefully transported to these sites only by humans or hominids? Likewise the perforations. The authors are aware that these tiny mollusks have mollusk predators that are able to drill through the shell and feed on the animal within. In the image immediately above, in P and Q, you see a hole drilled by Natica tecta. The Blombos Cave excavators note that such artifacts of predation show up 60% of the time in the natural death assemblages of this species. They also point out that they see none of these perfectly drilled fenestra in their archaeological sample. What are we to make of that? Of the facetting noted on several of the shells, both sets of authors claim that these must have arisen due to repeated contact between either bead and bead on a string of beads, or between some form of cordage or other material and the beads that were strung on. Finally, the ochre. What can we make of the microscopic presence of hematite on some of the shells from La Grotte des Pigeons? Let's take the transport agent to start with. Although the sea today splashes directly below Blombos Cave, that's not so for Pigeon Cave. The sea was also more or less close to Blombos cave at 80 ka. Not so for Pigeon Cave. If the same transport agent moved the shells from the seashore to the caves, it was capable of moving them several tens of kilometers. So. Was it humans/hominids, or was it something else? I'll admit that my efforts resemble more 'back-of-the-napkin' research than scholarly rigour, I was able to find at least one potential non-human transport agent capable of introducing such shells into the sediments at both caves---terns. Birds. The brown noddy [Anous stolidus] is known to collect such shells and incorporate them in their nests. The noddy is a tern. Terns occur throughout the world, and the brown noddy is native to South Africa and Morocco, as well as almost everywhere else in the world. How could one possibly rule out the possibility that these birds, or other occasional collectors, introduced these items to the archaeological context? 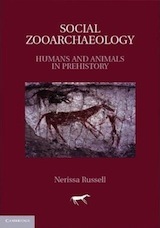 The authors would say that the nature and placement of the holes suggests human agency and the polish and traces of hematite support that conclusion. What about those holes? For starters, another quick trip to the internets tells me that at least two groups of animals are capable of boring through mollusk shell and that it is a commonplace the world over. 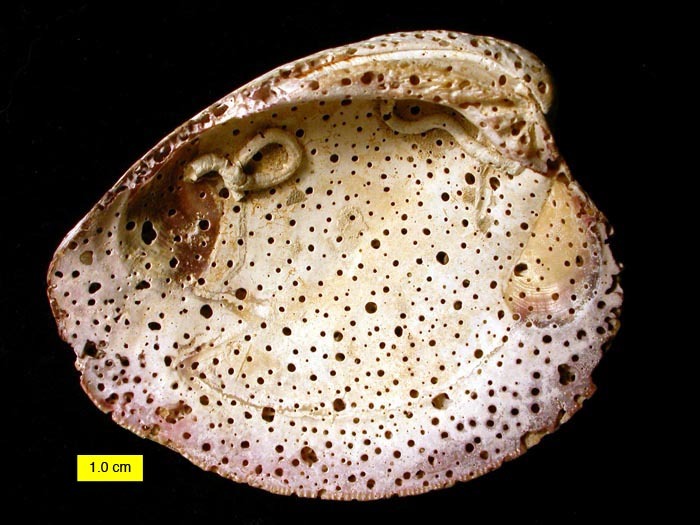 The one below is riddled with tiny perforations caused by a species of sponge. Yup. Sponge. In addition, as you'll have learned from the Henshilwood et al. paper, many species of predatory mollusks bore through other mollusk's shells to get at the living creature within. You'll be thinking "Yes, but the archaeological shells from Pigeon Cave and Blombos are not as beautifully regular as those left by sponges, or, for that matter by Natica tecta." True enough. They appear to be ragged, not drilled. More on that after the pretty picture. 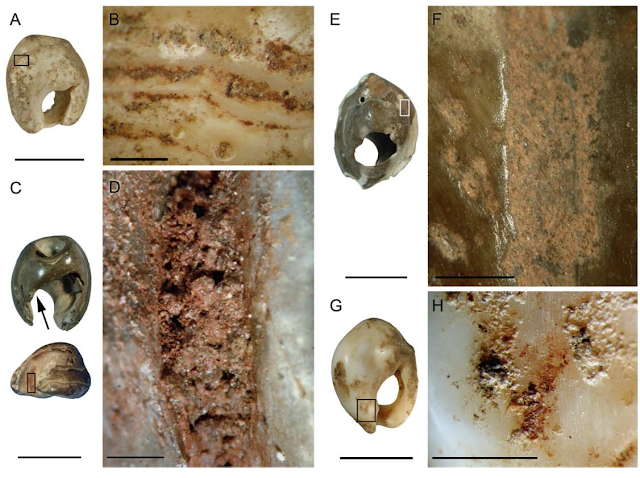 Far be it for me to accuse palaeo people of having a courser aesthetic sense than I, but the majority of the perforations claimed to be the result of human/hominid activity look as if they've been punched out by pressure applied either from the outside or from the inside. Who's to say that those rough perforations weren't the result of inadvertent pressure [underfoot, for example, or in pounding surf]? It's logical to assume that pressure placed on a part of the shell where a sea creature's boring had previously weakened that portion of the shell would be capable of punching out a larger hole. Damned difficult to choose. Don't you think? Natural? Or not? I realize that I'm merely casting doubt on the conclusions of the Blombos and Pigeon Cave archaeologists. Unlike the law, I can't employ the 'beyond a reasonable doubt' criterion when I'm interpreting an archaeological site. But let's face it. These claims are at best tentative, and would require, I believe, extensive experimental, ethnoarchaeological, and ethological examination before we accept them as fact. Ooops. almost forgot. The polish. I think the presence of polish on just a few specimens should rule out any notion that they'd been strung like beads on a necklace. At a minimum the authors would want to examine ethnographic strings of similar or identical shells before claiming that the rare facets they find are due to rubbing of one shell against another on a string. Moreover, if such shells are susceptible to wear when suspended on a string, they can just as easily get worn on a beach that comprises numerous other such shells. After all, they all originated at the water's edge. 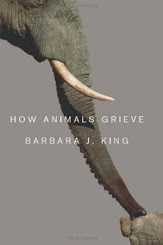 And, although the authors acknowledge that certain kinds of damage might be possible at the beach, their investigations of present-day death assemblages of these animals reveals to them that the modifications to the archaeological specimens are unlike those occurring on present-day strands. To that I would only say that time passes and circumstances change. What effect would over-harvesting of sponges have on the frequency of perforations on modern day mollusk death assemblages in Morocco? Or pollution in the Mediterranean? Or different substrates at different times at Blombos? I think you get my point. And finally the ochre. Again, if ochre can occur in a cave at a distance from the ocean, it can occur at the sea-side. For all of the reasons I've given here, it's clear to me that the claims from La Grotte des Pigeons and Blombos Cave should be viewed with extreme caution, if only because they're extreme claims for modern human behaviour at extreme time depth. I hope you enjoyed this little road trip to the seaside. See you *cough* next time. Richard III King of England 1483 to 1485. The ulnar nerve emerges from the C8/7--T1 vertebral articulation. There's a really good chance, in that case, that the ulnar nerve was entrapped in Richard's twisted upper torso near the upper extent of his severe scoliotic backbone. If so, there's an even better chance that his left arms was next to useless. And, if so, the muscles of his left arm would have atrophied, resulting in something that a medieval physician might want to refer to as "withered." That's it. That's all. Fearless prediction. You heard it here first. The Little Species that Could: Boivin et al. 's "Human dispersal across diverse environments of Asia during the Upper Pleistocene"
So, what can Boivin et al. tell us about our evolution that we didn't already know? Their paper gives us a possibility, not a likelihood. It accommodates some data. It tells a story. To the great pleasure of this reader the authors present some stunning graphics of the range of palaeoenvironments across Africa and Asia in the Pleistocene [see below]. These help to underscore their main contention that at different times during the Pleistocene, environmental conditions were changing such that anatomically modern bipedal apes would have had numerous opportunities to spread beyond Africa and into Asia. In that nutshell is, I think, the fundamental problem with Boivin et al. That's because, rather that supporting their arguments, the archaeological record as it stands is telling us that the anatomically modern version of Homo sapiens, extant between about 195 and 40 kyr ago, was little better at adapting to new environments than an African bovid. In the two maps shown below I've melded each of the four maps in the paper so as to produce a panorama of the pertinent geography at MIS 5 and 4. MIS 5—Interglacial conditions between about 130 ka and about 71 ka. From Boivin et al. 2013. MIS 4—Mainly glacial conditions from about 71 ka to about 60 ka. From Boivin et al. 2013. During MIS 5, the authors point out, a continuous, hominid-friendly, environment spanned northeastern Africa, the southern Arabian peninsula, and southern Asia. In other words, Nature afforded H. sapiens a 'way out' of Africa during MIS 5. By contrast, in MIS 4, that same part of the globe was covered in red---i.e. not a nice place for hominids. So, no hominids got out. In so doing [IMHO] the authors paint a picture of a species that was so niche-specific as to be incapable of any kind of rapid adaptation to new environmental conditions. In none of the discussion do Boivin et al. appear to realize the apparent behavioural rigidity their model proposes as characterizing early anatomically modern H. sapiens. Indeed, their model stands in stark contrast [it seems to me] to the almost infinite behavioural plasticity that we've grown accustomed to hearing about whenever someone is listing the hallmark manifestation of we modern humans. Boivin et al. are begging the question "Were they human like us?" 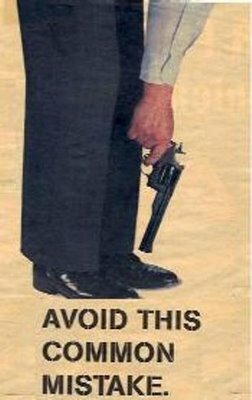 By adopting this posture toward H. sapiens, the authors shoot themselves in the foot. Indeed, they appear to be arguing for a reduced set of 'cultural adaptations' prior to the time that people like us first set foot in southwestern Asia about 40 or 50 kyr ago. The more recent H. sapiens had a recognizably modern set of abilities, and it is those H. sapiens that, in a geological blink of an eye, spread across Asia and into Australia [the actual duration of the spread may have been on the order of 5,000 years]. 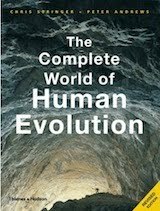 What's more, the behaviourally modern H. sapiens did so by changing gears whenever they encountered a novel ecosystem. Think of it. If Boivin et al. 's vision of H. sapiens's capacities is anywhere near accurate they'd have a hard time explaining the persistence of the Inuit or the Tierra del Fuegans, both of which groups have managed to survive in, without doubt, the harshest conditions on Earth. Overall, I'm incredibly happy to accept Boivin et al. 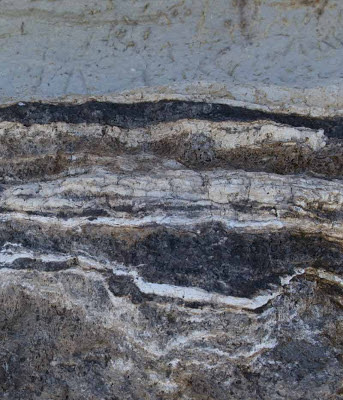 's portrait of the environments in marine isotope stages 4 and 5, the interglacial/glacial swing during which Homo sapiens arose in Africa, i.e. somewhere between about 190 ka and about 160 ka. From that time until about 40 to 50 kyr ago the authors aver that Homo sapiens didn't just pop out once, but did so numerous times, following different pathways, and biomes. All along the archaeological world had been aware of two excursions by H. sapiens out of Africa---one about 100 ka and the other at 40 to 50 ka. 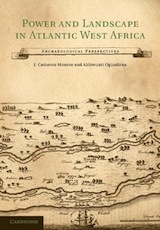 The authors propose that it may not have been as simple as the archaeological and record might have us believe, and that there may have been at least one more and possibly many more excursions out of Africa that are, at present, archaeologically invisible. Getting back to observations for the moment. At around 100 ka we see anatomically modern Homo sapiens at Qafzeh Cave in what's now Israel. At that time H. sapiens was evincing the same behaviours as those of their contemporaries, the Neanderthals, which were distributed across Europe and into Central Asia. And here the authors' idea runs out of gas, by not recognizing the possibility that, anatomical similarities notwithstanding, the two excursions could easily have been undertaken by two behaviourally very different flavours of H. sapiens. It has to be admitted that the Qafzeh H. sapiens at 100 ka was not acting as if they were people like us. 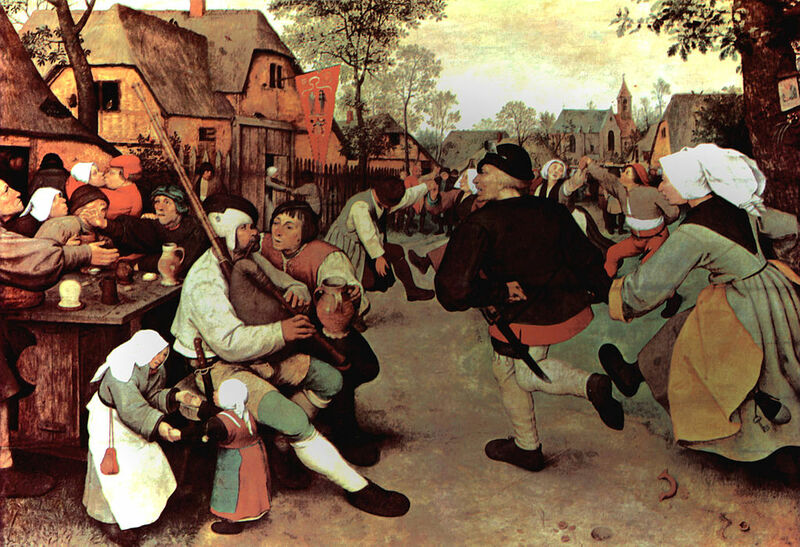 They were, instead, behaviourally just like good Neanderthals---e.g. the same, Mousterian, behaviour with respect to working stone. Moreover, the Qafzeh hominids arrived in the Levant along with an African fauna, all of which appear to adhere to Boivin et al. 's model for expansion. But those earlier H. sapiens got no further, apparently, than that environment allowed. Because, by the time the environment had returned to glacial conditions, the Neaderthals were inhabiting the same geographic place that had been held by the Qafzeh hominids for at least 40,000 years previously. It appears, then, that the Neanderthals were associated with a western Asian faunal community. Thus, we have a picture of two species, acting in similar ways, each constrained by different environmental conditions. I'm sorry. That just doesn't sound to me like they were much like us. I'm not fond of nothing buttery. However, I see no other conclusion to be made but that anatomically modern bipedal apes at 100 ka were not cognitively similar to you and me, and thus couldn't adapt to the transition from interglacial to glacial conditions. The authors state that many have called the dispersal of H. sapiens into the Levant around 100 kyr ago 'failed.' In fact they thrived for at least 40 kyr in the Levant in just the same way as they had done since arising in Africa---perhaps almost 200 kyr ago---and exploiting an almost identical environment to that which supported them in the Levant from about 100 kyr to about 60 ka. Indeed, the 'failed' dispersal that Boivin et al. refer to was no dispersal at all. It involved a creature bound to its ecosystem and its niche---albeit a different one---in the same way that it appears the Neanderthals were bound to theirs during their 200-or-so-thousand-year tenure. Boivin et al. are quite correct in pointing out the equivocal nature of the genomic observations being talked about these past few years. Given the behaviour of the Qafzeh H. sapiens and that of the Neanderthals, a parsimonious reading of the data is that anatomically modern H. sapiens came in contact with, and may indeed have bred with, Neanderthals during the forty or so thousand years that H. sapiens was in the Levant. 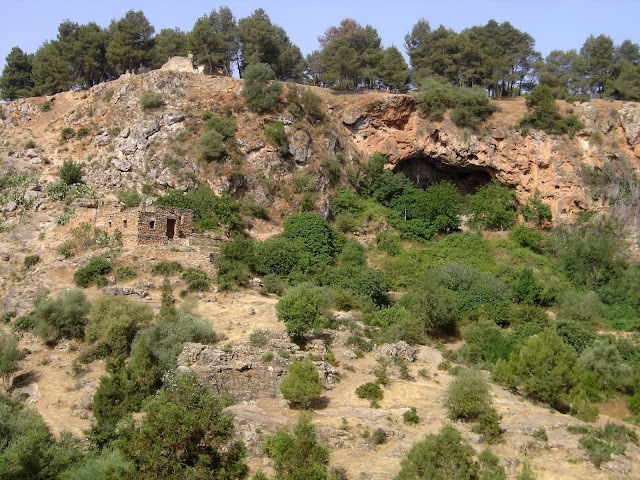 In all probability there was a frontier somewhere to the north of Qafzeh Cave where the two kinds came in contact for at least some portion of those 40 kyr. Such a scenario makes sense [to me at least] of the genetic evidence that we're seeing in the present. Any interbreeding that may have gone on between the two species could have been a fait accompli by the time behaviourally/cognitively modern H. sapiens entered Europe. Thus, we dont have to imagine a time when people like us encountered and then mated with Neanderthals. Further evidence that neither the Qafzeh hominids nor the Neanderthals were like us might be drawn from the observation that there was no extirpation of the Neanderthals coincident with the earlier anatomically modern H. sapiens expansion into the Levant between 100 and 60 kyr ago. In other words, for the 40 or so thousand years during which they were neighbours, there appears to have been no anthropogenic cataclysm comparable to that which many would argue was visited on the Neanderthals during the latest excursion from Africa of cognitively modern H. sapiens like you and me. If, indeed, H. sapiens spelled the doom of the Neanderthals between about 40 and 50 kyr ago, if the Qafzeh hominids were exactly like us, what explains the persistence of the Neanderthals? In the end, Boivin et al. 's narrative ignores the real likelihood that there were evolutionary changes within H. sapiens between the time they occupied Qafzeh Cave at around 100 kyr ago and about 40 kyr ago, when people like us colonized the world. In the search for answers to the question of when hominids became human, I think the disciplines of archaeology and palaeoanthropology have some distance still to go before gaining a truly accurate accounting of recent evolution. This piece took me much longer to put together than I had originally anticipated. Next time I'll have something to say about the latest data on the latest Neanderthals in Spain. Neanderthals May Indeed Have Bowed Out Before We Came On the Scene. I'll be able to say more on the morrow. 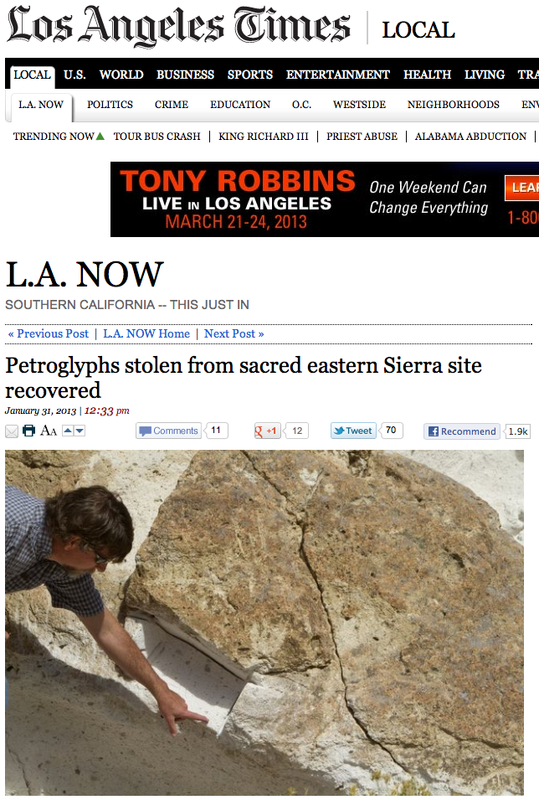 Ripped From the Headlines: "Petroglyphs stolen from sacred eastern Sierra site recovered"
This is how you know when your particular archaeological interest has the dubious honour of having "made it" in the "art world." Photo: U.S. Bureau of Land Management archaeologist Greg Haverstock in November inspects vandalized archaeological site where power saws were used to remove 3,000-year-old petroglyphs. From Los Angeles Times blog L.A. Now and its author Louis Sahagun comes a very distressing article. 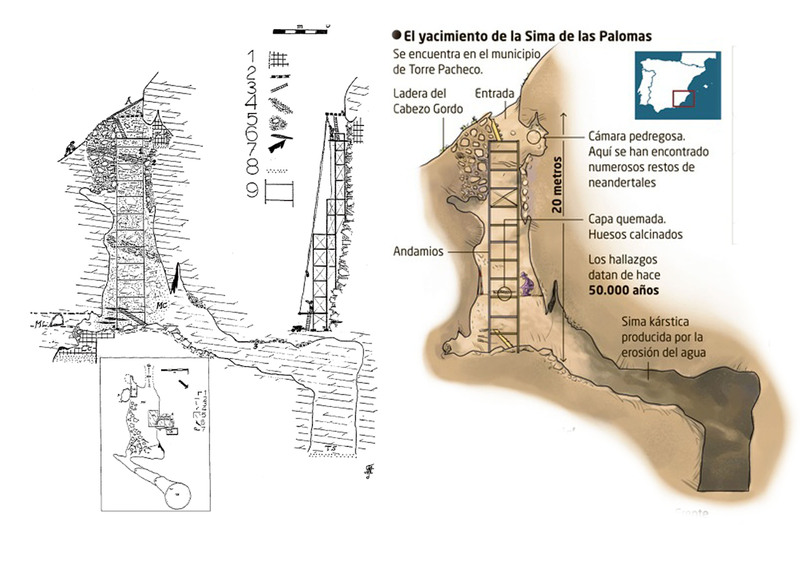 Archaeologists in North America are used to reading about the depredations visited on Mesoamerican monumental architecture, stelae and mural art. But this is the first I've heard of someone excising an objet d'art from the parent rock north of the Colorado River. The worst I've heard of was graffiti vandalism. But never anything like this or on the scale reported in the Times article. Amazingly, they have suspects in custody. I'm betting on an avant grade interior decorator or an architect running amok, and not thieves hoping to make a mint trading in these antiquities. Regardless, guys like this woulda been shot in Dodge City if I'd been Sheriff! Unfortunately there can never be enough eyes on the ground to ward off such depredation. In this case the perps were ratted out. It means that all that the rest of us can do is keep our ears open for "loose lips. "Happy hunting. Probably News to No One By Now. The Younger Dryas Impact Does A Crash 'n' Burn. Marco Langbroek: This One's For You! 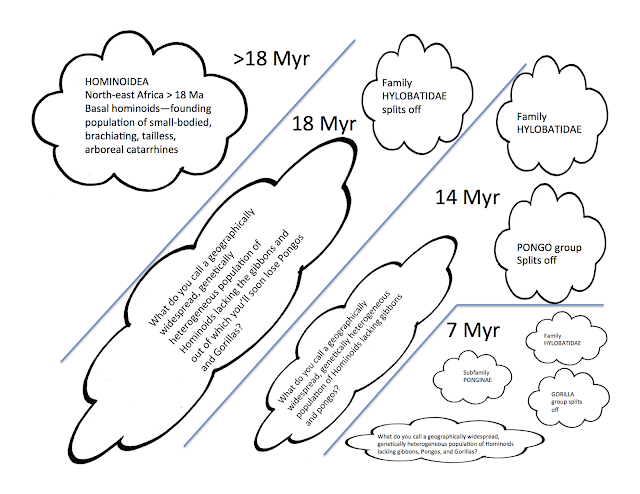 One rendition of the putative [and now forever debunked] Younger Dryas Impact theory. 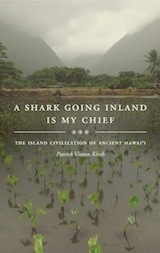 Kathleen Nicoll (U. Utah) alerted me to this yesterday when she sent a reprint. Tip o' the hat, Kathleen. She's second author on this paper. The news is all over the science pages on the web, too. So, I'm certain that you all prolly know evrything 'bout it. Still, there may be one or two. Well, this one's for you! M. Boslough, K. Nicoll, V. Holliday, T.L. Daulton, D. Meltzer, N. Pinter, A.C. Scott, T. Surovell, P. Claeys, J. Gill, F. Paquay, J. Marlon, P. Bartlein, C. Whitlock, D. Grayson, and A.J.T. Jull (2012), Arguments and evidence against a Younger Dryas impact event, in Climates, Landscapes, and Civilizations, Geophys. Monogr. Ser., vol. 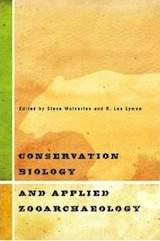 198, edited by L. Giosan et al. 13–26, AGU, Washington, D. C., doi:10.1029/2012GM001209. 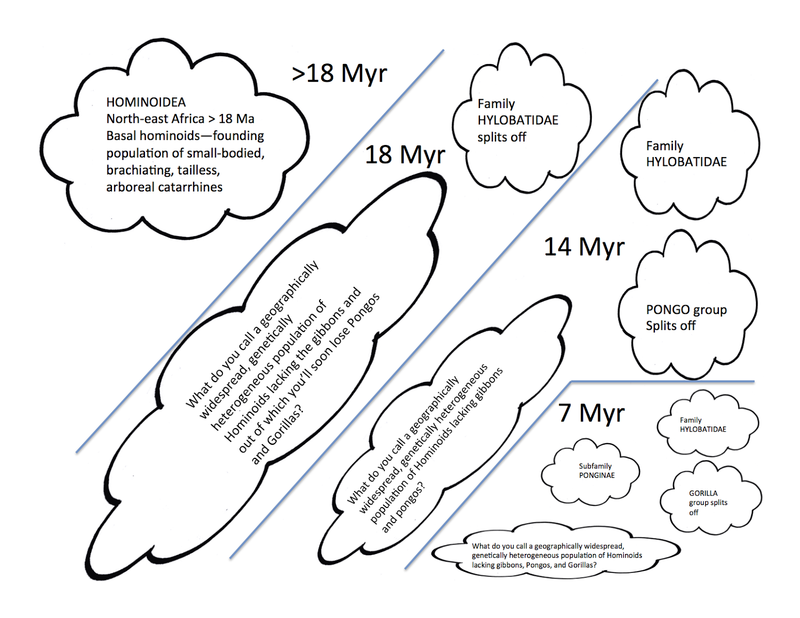 This paper exposes the fanciful nature of claims made for an extraterrestrial body that was supposed to have created an environmental cataclysm at the beginning of the latest of the Pleistocene glaciations---the Younger Dryas. Alongside these claims was the argument that this would have spelled doom for the so-called Clovis people who inhabited North America between about 14 and about 12 kyr ago. Boslough et al. first give lie to the various scenarios that the Younger Dryas impact proponents have erected to explain a) an impact with no impact crater, and b) the impossibility of an 'airburst' of sufficient magnitude to have spread its destructive energy across North America south of the ice margin. Put simply, even if a sufficiently large object had made contact on the waning Laurentide Ice Sheet there would have been impact evidence on the ground in the present. No such exist. As for the 'airburst' idea, physical principles tell us that to have been large enough to create a continent-wide cataclysm it needed to have broken up well above Earth's atmosphere [i.e. in space, fer gawd's sake!] 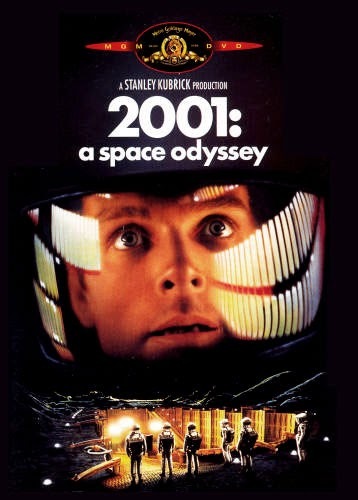 and unless there had been a gigantic explosion inside the offending celestial body, and that even if had broken up through some mysterious, previously unheralded physical laws, such a missile would simply have continued on its course, with the various bits in close formation, and have had the same 'footprint' as if it had been all one piece. first time a human being had witnessed the collision of two celestial bodies. If that weren't enough to put the YD impact idea in the circular file, the authors go on to point out the shortcomings of the sedimentary and chronological record that YD enthusiasts claim amounts to de facto evidence of an extraterrestrial impact: specifically, the so called Black Mats that in places occur around the time of the Younger Dryas. They occur at other times, and far enough away from the lower half of North America that they can't be used as a time marker, much less as evidence---in and of themselves---for such impacts. The authors also find erroneously identified materials used as evidence, contaminated samples, poorly dated sediments, and on and on. Read it. This paper eviscerates the YD impact theory. And, although we're not treated to the actual physics computations I think we can be fairly certain that the counter-claims made in this article will stand up in the court of archaeological opinion. 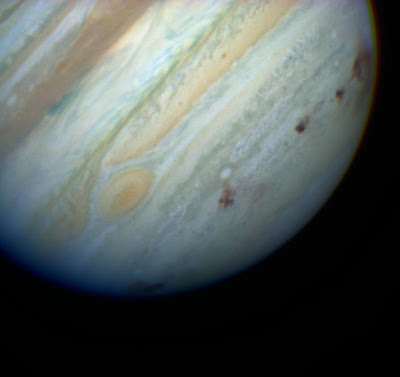 That's because Boslough is the guy who accurately predicted the effects of the break up and impact on Jupiter of the comet Shoemaker-Levy 9 in mid 1994, and whose model won out against the prognostications of the rest of the scientists in the field. The team that put this paper together comprise the glitteratti of a half-dozen scientific disciplines, including our own. Not that I'm appealing to authority here [everyone knows THAT's fallacious]. I'm merely pointing out that this is no *cough*cflash-in-the-pan, slash and *cough, cough* burn, criticism. They dismantle the YD impact theory. Full stop. This is the kind of scrutiny that needs to be applied to every [and I mean every] one of the claims of the kind the Subversive Archaeologist is determined to overturn. I've been going to say this for a few weeks now, but couldn't find the right platform. Now I can. With independent and non-partisan examination, could we not---for example---once and for all, address the possibly erroneous early dates for modern human behaviour from the caves of southern Africa? I focus on this one simply because I'm not a physicist. Neither were the YD impacts proponents. And, although the OSL daters of those south African caves are physicists, too, I think their technique [or more correctly, their method] is due for a thorough going over. The point is: the work is there to be done. And although several people have asked me to work with them on some of the issues, I truly believe my mind is best applied to my activities at the Subversive Archaeologist. I'm happy pointing you in the right direction. With that in mind. Get busy! Great things are afoot! Oh. And. I still have work to do on the "Out of Africa, Out of Africa Again, and Yet Again Out of Africa" business recently posited by Boivin et al.